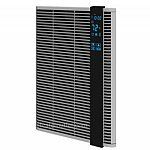 Electric forced-air wall heaters are fairly inexpensive and a good choice for heating a small garage or just a portion of a larger garage, such as a work-space area off in one corner. They are available in 120 volt and 240 volt models and put out enough heat for a space of 100 square feet on up. They aren't efficient enough for heating an entire two or three car garage, but for a small area they are fine with a low first cost. The Qmark model shown at the left comes in 120 volt and 240 volt versions and are designed for recessed mounting in your wall stud space. The 120 volt model puts out 1500 watts and will heat a space up to 120 square feet. The 240 volt version puts out 2000 watts and will heat a space up to 200 square feet. These small units are very effective overall for heating a small portion of a larger area. 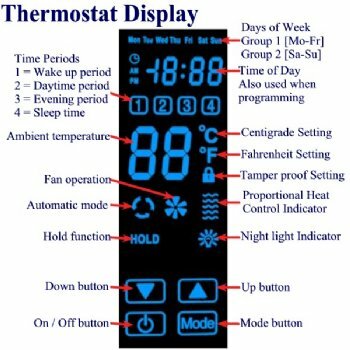 Both of these units have a built-in adjustable thermostat mounted on the face of the unit. Their virtue is their low first cost which is under $225.00 for either model. 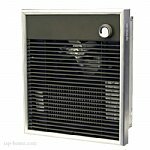 If you are looking for very basic heat in your workspace, these type of electric heaters may be just right. The Qmark wall heater shown at the left also comes in 120 volt and 240 volt versions and are designed for recessed mounting in your wall stud space. The 120 volt model will heat an area up to 150 square feet and the 240 volt model will heat an area up to 200 square feet. These units have a digitally programmable face panel that allows for timed-delays of the heat-up process. The panel, shown below, allows for all type of control settings that can be used for various time/date settings which makes these wall heaters very versatile. Two of the 240 volt models would easily heat an entire single car garage (12 x 24) that is moderately insulated. Both models retail for under $315.00. The simplicity of all of the Qmark units is that they draw surrounding air in through one portion of the face-grille and run it past electric heating elements and then return it through another portion of the face-grille as heated air. If you have masonry or concrete walls in your garage you can build a surface mounting box from 1 x 4 pine material and mount the units in the boxes. The boxes can be secured with six (6) 1-1/2" x 1-1/2" metal angles on the inside face of the box to the wall surface using lag-screws to the concrete or masonry, and wood screws to the box.